Naftogaz Ukrainy and Kyivteploenergo on October 12 signed a contract for gas supply based on the amicable agreement approved by the Economic Court of Kyiv on October 10. 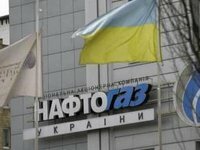 "Simultaneously with the signing of the contract, Naftogaz provided Kyivteploenergo with nominations for the middle of October. Therefore Kyivteploenergo has the opportunity to resume hot water supply in Kyiv and start the heating season on time," Naftogaz said. Kyivteploenergo will receive gas on preferential terms, determined by the government for heat producers who provide thermal energy to the population and other protected consumers. First Deputy Chairman of Naftogaz Serhiy Pereloma expressed hope that if in other cities someone changes the manager of the heat supplying enterprise, all the necessary actions will be taken in advance to avoid inconvenience for consumers.